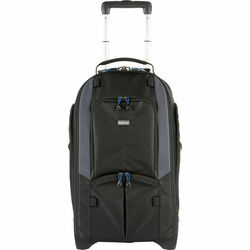 The StreetWalker Rolling Backpack has all the features of the StreetWalker HardDrive. That means it will accommodate quite an array of gear in addition to your laptop. Think Tank rates it as capable of storing 1 gripped & 1 standard DSLR, a flash, plus 5-7 zoom lenses (only if they’re small – otherwise one large lens and 2-3 smaller ones). In my case, I’m able to travel with my Nikon D810 and Nikon D7500 backup camera, along with a telephoto zoom (I’ve used the Sigma 150-600mm Contemporary lens, as well as the Nikon 200-400mm f/4 lens, depending on the trip), my Tamron 24-70mm f/2.8 lens, my Sigma 12-24mm lens, a flash, Dell XPS 15, speedlite, laptop charger, mouse, external battery for my tablet, and Nikon 70-200 f/4 lens. If I wanted to bring my Nikon 70-200 f/2.8 along instead of the f/4, I’d either have to overstuff the bag or give up on the 12-24. Either way, it is quite a bit of gear in a pack that fits in the overhead and also allows room for both padded backpack straps and roller wheels and a handle. To accommodate the roller wheels and handle, Think Tank has made some changes to the bag. The first thing you’ll notice is that it is much heavier: 8.2 pounds instead of 4.5 pounds. So you’ll have one more reason to take advantage of the wheels when you can. The laptop compartment has also been moved from the strap side to the front side. In the process it has gotten a little smaller. My 15.4-inch laptop fits, but just barely. Personally, I preferred having the laptop nicely stashed in the back of the pack, but obviously that wasn’t possible for the roller configuration. The bag is also a little bigger. It is still technically within US Domestic carry-on standards at 12.6-inches x 21.9-inches x 9-inches, but that assumes you don’t overstuff it and that the airline isn’t looking for excuses to keep bags off the plane. It does make it a little large (one inch too long technically) for overseas carry-on standards, which concerns me a bit. In practice I’ve carried bags this size and larger all over the world without too much trouble, but every flight and every airline is another chance for someone to decide to enforce the letter of the law. for our Alaska Bear & Puffin Photo Safari next July! Which version of the StreetWalker is right for you? If you don’t have any long hauls, the pure backpack version – the StreetWalker HardDrive has a nicer laptop storage option (that you can use without hauling out the bag and opening the photo section), and is about one-half the weight (and somewhat less expensive), so it is a no-brainer choice. But if the idea of lugging it around through airports or Wildlife Refuge parking lots or on long treks to remote blinds, then the StreetWalker Rolling Backpack is a better option. It is just as easy to use when shooting in a vehicle, although you’ll probably want to have ditched your laptop back in your hotel room, so you don’t have to lift it up with the lid of the photo section all the time. If you don’t need room for a full-on DSLR rig and super-telephoto lens, you should also consider either the StreetWalker Pro v2.0.